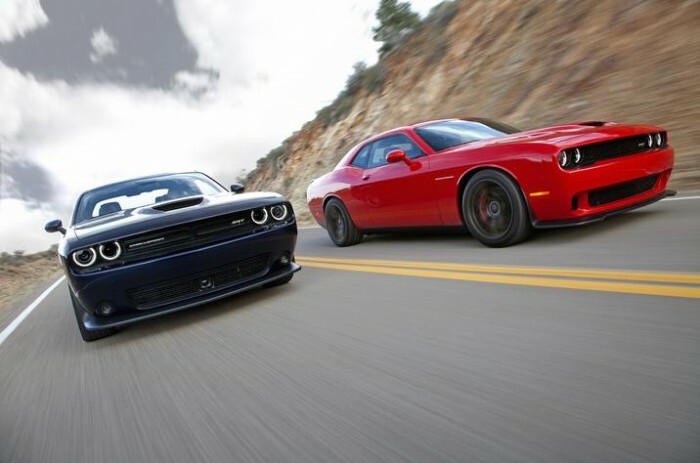 Disregarding the 2015 Challenger SRT for not being as powerful as the Hellcat is like jumping out of the path of a train to get hit by a bus. It should be noted that we are still throwing money at our screens until 2015 Dodge Challenger SRT Hellcats emerge from them, but we are not so busy with our ever-maddening display that we can’t take a moment to double back and shed some much-deserved light on the 2015 Challenger SRT and the no-less-ridiculous 392 HEMI® V8 beneath its hood. With the SRT Hellcat’s 600+ horsepower earning it the title of most powerful Challenger ever, it’s easy to overlook the non-Hellcat Challenger SRT. And that would be pretty considerable mistake, after all, provided that its upgraded 392 HEMI V8 boasts more horsepower and torque than its predecessor. For the 2015 model, the 392 will generate 485 horsepower (up from 470 hp) and 475 lb-ft of torque (up from 470 lb-ft). The 392 HEMI can be mated to either the TorqueFlight eight-speed automatic or six-speed manual transmission. The 2015 Dodge Challenger SRT comes standard with SRT-exclusive “77” eight-spoke 20 x 9-inch forged-aluminum “Hyper Black” wheels, which are wrapped in 245/45ZR20 Goodyear RSA2 All-Season or available Goodyear F1 Supercar Three-Season tires. This means that if you’re a mom or dad who doesn’t feel like toning down your badassery in order to have a more practical ride to let your teen practice their driving skills, you can simply set a four-digit PIN and ensure that your kid doesn’t get too crazy behind the wheel of your beast. The 2015 Dodge Challenger SRT 392 will be available in 11 different colors: B5 Blue Pearl Coat, Billet Silver Metallic Clear Coat, Bright White Clear Coat, Granite Crystal Metallic Pearl Coat, Ivory White Tri-Coat Pearl, Jazz Blue Pearl Coat, Phantom Black Tri-Coat Pearl, Pitch Black Clear Coat, Redline Tri-Coat Pearl, Sublime Metallic Pearl Coat, and TorRed Clear Coat. The 2015 Challenger SRT will also offer available Black Satin Gloss or Silver High Gloss twin, full-body stripes. So, yeah, the Hellcat is going to get the bulk of your attention, but don’t sleep on the SRT 392. That’d be like swimming into a school of tiger sharks to avoid a couple of Great Whites.